experience that is ready to work for you! depends upon exceeding our customers expectations. We achieve this by providing premium fence products, with unmatched service and workmanship, adding safety, security, definition, and value to our customers property. We will achieve this objective through dedicated employees, commitment to continuous improvement, persistent innovation, and integration of the latest technology. Darin has been in the fence industry for over 19 years, installing, managing, estimating, and starting Inland Fence. Darin was born and raised in Coeurd'Alene and believes in running the company like a family, rather than a business. He enjoys golfing and relaxing with the love of his life and partner Amy. Rich brings a multitude of knowledge to our business. He has been in the fence industry since 1976. He has designed and built every fence imaginable, with a great sense of perfection and satisfaction. 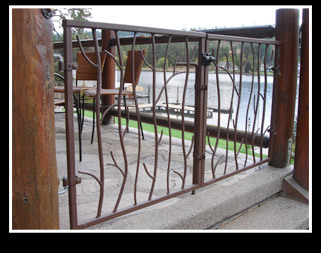 Rich builds all of our custom iron gates, railing, ornamental iron fence, and everything else under the sun. He also maintains all equipment, tools, grounds, and structures at the company. He enjoys hunting, fishing, and building things with his hands. Bill comes from a family that all have been involved in the fence industry. Bill was 14 years old when he started working for his dad's fence company in California. One brother still owns a fence company in California and another brother owns an entry systems business in California. With his 42 years of experience, you will be assured of professional service and sales. Bill enjoys golf, softball, and frappe Fridays. Jim has been involved with fencing for over 23 years. He started as an installer, then moved into the shop and learned to weld and build gates and kennels. Jim does all ordering of products, builds gates, kennels, custom panels, and anything else needed by the installers to make their job easier. Jim enjoys NASCAR, Boise State football, and an occasional drink.